By now you know I love cookies, but sometimes I even love a bar cookie even more than a traditional cookie. 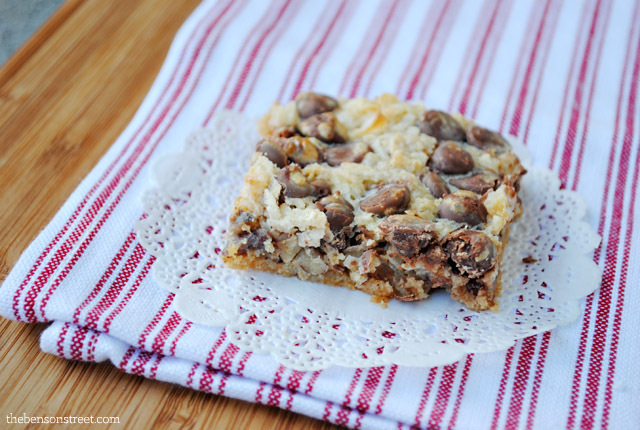 Now if you want a delicious and easy fun bar cookie try magic cookie bars. They truly are magic, because that are like a party in your mouth and tummy. Chocolate chips, coconut and pecans create a delicious pairing of flavors. Perfect to enjoy at any holiday party or just when you need a little treat. Easily add ingredients into a pan and bake. That is what makes these simple and fun. No dropping cookies onto the cookie sheet, just bake, cool and share. These cookies might be a little more of the adult variety due to the nuts and coconut, but maybe if you can get the kids to give them a try they will fall in love! Do you like bar cookies or traditional drop cookies better? An easy bar cookie recipe. Sprinkle graham cracker crumbs in a 9 x 13 pan. Melt margarine and drizzle over crumbs in pan. Pour half of sweetened condensed milk over the crumbs. Pour remaining sweetened condensed milk over ingredients in pan. Press down gently over all the bars.